The parents of Jessica Lynch say they are not prepared to discuss details of their daughter's controversial capture and rescue in Iraq. 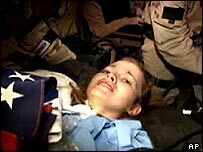 Greg and Deadra Lynch also said they could not comment on reports disputing the US military's account of her rescue from an Iraqi hospital on 1 April. An investigation by the BBC's Correspondent programme said the story of the rescue was "one of the most stunning pieces of news management ever conceived". But the Pentagon denies claims that the facts of Private Lynch's rescue were misrepresented by the US military, saying they are "void of all facts and absolutely ridiculous". "We're really not supposed to talk about that subject," Mr Lynch said during a news conference at the family's rural West Virginia home. "It's still an ongoing investigation and we can't talk about anything like that." The US army told BBC News Online that the Lynch family had been advised on how to handle the media interest in the rescue, which is subject to a military inquiry. But a spokeswoman added: "The army does not tell people what they can or cannot talk about. We have advised the family, but they have free speech and know they can talk about what they want." The 19-year-old army supply clerk from Palestine, West Virginia, is being treated at a Washington hospital for injuries suffered when her convoy was ambushed outside Nasiriya. Nine of her comrades were killed and Private Lynch was taken to the local hospital. 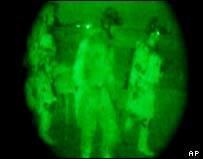 Eight days later US special forces stormed the hospital, capturing the events on a night-vision camera. The rescue was extensively reported around the world, with the pictures of the rescue turning Private Lynch into a cult hero in the United States. But Correspondent said the US military knew there were no Iraqi forces guarding the hospital, and quoted a local doctor saying that the troops used blank rounds to "make a show" of the operation. The programme also questioned reports that Private Lynch had stab and bullet wounds, and that she had been slapped about on her hospital bed and interrogated. But the Pentagon said no blanks were used, and that all the procedures used were consistent with normal operations when there is a threat of encountering hostile forces. Doctors now say Jessica Lynch has no recollection of the whole episode and probably never will.